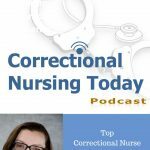 Lorry’s guest on this podcast episode is Kenneth Faiver, MPH, CCHP, a correctional health care consultant and expert witness from Lansing, MI. He has been active in correctional health care for decades including nearly 20 years in healthcare leadership roles for the Michigan Department of Corrections. 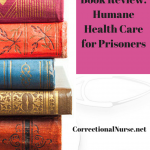 Ken is the author of the recently published book “Humane Health Care for Prisoners” and is presenting a session called Introduction to Ethics in the Practice of Correctional Health Care at the 2017 NCCHC National Conference on Correctional Health Care. 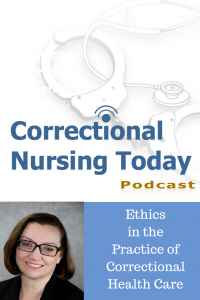 While the study of ethics can seem academic and theoretical, those of us working in clinical practice need to practically apply ethical principles daily. 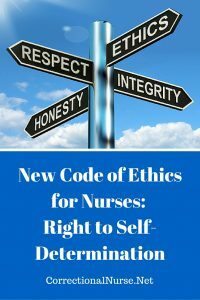 According to Ken, ethics can be described as simply as ‘doing the right thing’ for our patients. He has seen many examples where patients were not the central reason for care delivery and patient autonomy or advocacy was not considered. While the majority of correctional care providers desire to do the right thing, there are enough examples around to give concern. Ethical requirements are based on our human nature and values while laws are rules and regulations that have been codified by government. Many legal actions in the recent past such as eugenics, slavery, and forced sterilization were not ethical practices. In other words, just because something is legal does not mean it is ethical. Ken clearly sees an obligation of healthcare staff to address harmful or unethical institutional practices like those listed above. We also have an obligation to address individual staff practices that are abusive or unethical. He offers these suggestions. If you can, speak directly to the staff member. You might be able to help them get back on track. Abusive practices that continue must be addressed with leadership. Loyalty to co-workers should not be more important than loyalty to patients. See the person you are caring for as a patient rather than an offender or prisoner. The status of the person should not affect the care we deliver. In closing, Ken acknowledged that there is a corrosive effect when working in correction. We must be ever aware of how the correctional environment affects our clinical practice. To get a copy of the book directly from Praeger publishers or get the book directly from the author for $66 postpaid. Email kfaiver@gmail.com to work out arrangements. What ethical situations do you encounter in your correctional nursing practice? Share your thoughts in the comments section of this post. 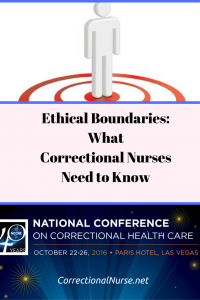 This post is part of a series discussing topics addressed during sessions of the 2017 National Conference on Correctional Health Care. All posts in this series can be found HERE. Can hardly wait to go to this session. How timely in today’s world.